School is finally out for summer! My girls were so excited for it to end and have a busy summer planned including a trip to Ontario, a wedding, a visit with Grandma and Poppa and possibly even summer camp! Both of them are really excited and have been looking forward to July and August for months now. Olivia, my oldest daughter, normally attends camp every year, but unfortunately she won’t be able to go this year. She’s bummed about it because she always had so much fun and this year she would have been a CIT (Counselor in Training). Bridget, on the other hand, has never been to overnight camp. She’s been to day camp many times though and always has so much fun. She might be a little young for overnight camp this year, but day camp is definitely an option for her. This year, I’m getting organized! 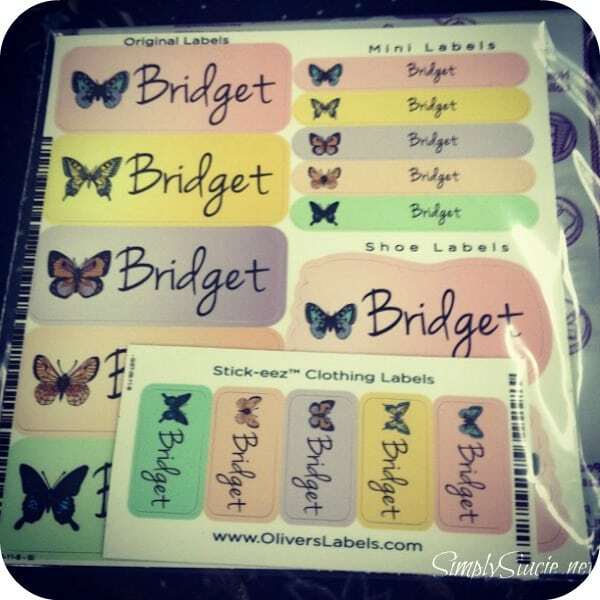 I recently received a Sample Pack from Oliver’s Labels which includes Original Labels, Mini Labels, Stick-eez Clothing Labels and Shoe Labels in the Butterfly Design with “Bridget” in the Jenna font. 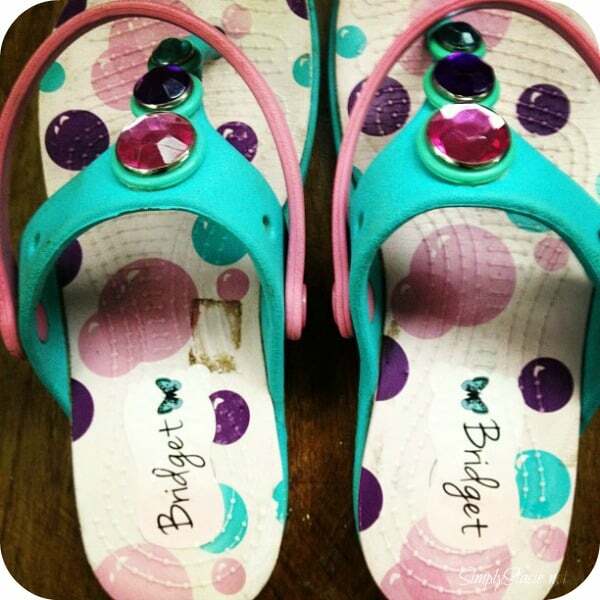 I used to write her name on her shoes, backpack, jacket, etc with permanent marker so she could keep track of her stuff when she went to school and day camp. I always felt like I was ruining her things though because it looks so messy. With these labels, it looks so pretty! MUCH MUCH better than the job I would have done! Oliver’s Labels has a great selection of full-colour labels in over 40 different designs. I debated on which design to choose because so many of them would have appealed to her. I ended up picking the Butterflies design for Bridget, but I also really liked the Cupcakes, Dinosaurs and Animal Faces. For Olivia, I would have selected something more grown-up looking like the Rococo or Sweet Hearts. Quality and durability matter to Oliver’s Labels labels as their labels are waterproof and scuff-proof and are made to last. They even guarantee that the printing will not rub off! The sticky labels can be used on items that go in the dishwasher, microwave, fridge, freezer and outdoors while the clothing labels can be washed in the washer and dried in the dryer. 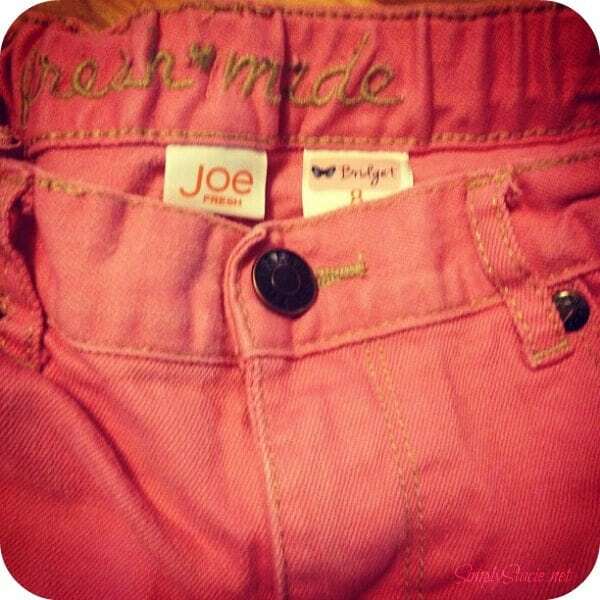 I could tell these were high quality labels when I was adding them to Bridget’s clothing and supplies. They were easy to peel and stick and stayed firmly in place. So far so good! She really likes them and thought they were pretty neat. Another unique service that Oliver’s Labels offers is Found-it™, a free online lost and found system. When you order your labels from Oliver’s Labels, they give you the option of adding the Found-it tracking code to your labels. If the item is ever lost, the person can go to a special page on the Oliver’s Labels website and input the tracking code. You will be notified immediately via email and can set up arrangements with the finder to get the item back. Oliver’s Labels acts as the intermediary to keep your personal info safe. This service is completely optional and it’s up to you if you want to participate or not when you place your order. Choose a fun design, pick a font you like and you are set! I would like to get my daughter the Nature preschool pack. i like the cupcake photolabels! I’d love the Camp Package! Outer Space Iron-on Clothing Labels.